I spent the last two hours of the day with a Hooded couple and one male Common Merganser. Peaceful entertainment. Last edited by Karl Egressy on Sat Apr 13, 2019 11:38 pm, edited 1 time in total. Love the wings up- sweet pose-shows her nice white markings, and crest up. Lovely shot. Karl, the detail and definition in the feathers is absolutely beautiful – excellent image. you got all the details on this female, nicely done KARL. Nice, eh! 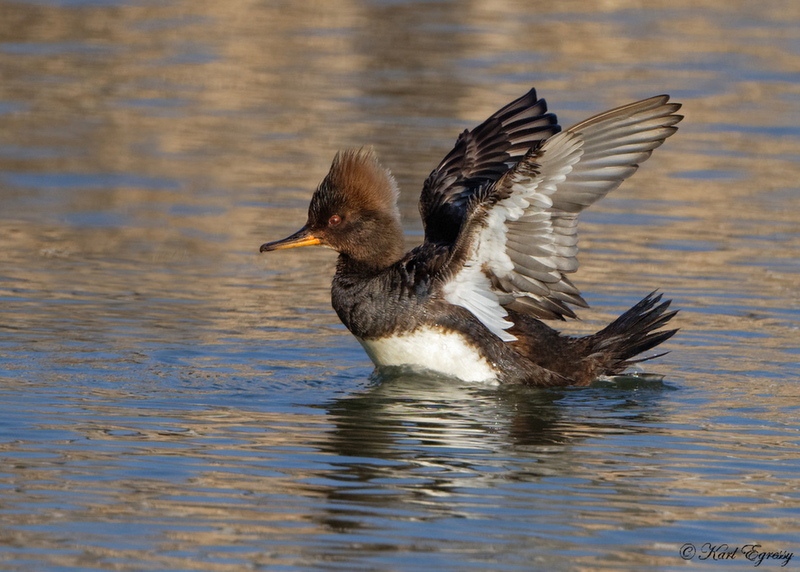 You certainly have a lot of Merganser's in your area. Do you see other species where you are? Detail is excellent. I think you could lighten the face a tiny bit and bring out more detail. I also think you could lighten the face and eye a tad. Actually we have very few in the two Ponds I have been visiting and only during migration. Along the river, however, a couple of females nest and have little ones later. The males disappear altogether from the area. Thanks, Dan. I lightened up the face and eye now. What a beauty! I love the "haircuts" on these ducks. Nice wing flap. Good job Karl! Another beauty with that lovely golden flecked water! Great wing flap and such exquisite detail, Karl.